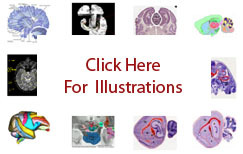 The term putamen refers to a predominantly cellular component of the striatum in the primate. Defined on the basis of Nissl and myelin stains it is more lateral than the other component, the caudate nucleus. The caudate nucleus encircles the putamen, separated from it by the internal capsule ( Carpenter-1983 ). The caudate nucleus and the putamen are not distinguishable in the rodent. There the myelinated fibers that pass through the striatum to connect the cerebral cortex and subcortical structures do not form an internal capsule but are distributed throughout the striatum. Thus, in the rodent the striatum is often called 'caudoputamen' ( Swanson-2004 ). In the striatopallidal system, the classical striatum, or caudoputamen, is the largest part of the dorsal striatum ( Heimer-1995 ). Functionally it is part of the cerebral nuclei ( Swanson-2004 ).